Once the dialog appears, if you dont see your music clips or music folders in the white area above, click the browse button to locate the folder where you store your music clips. 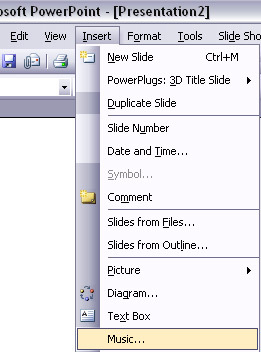 Select the music style of your choice to be played back during a PowerPoint presentation from the Music Clips pane. If you select a specific music clip (as shown above), you can apply it to the selected slide(s) or to the entire presentation by clicking "Apply" or "Apply to All button" respectively. The following table describes the functions of each button / control within the dialog. Shows the current file path to the music clips. This text box is not editable. It is a status display only. 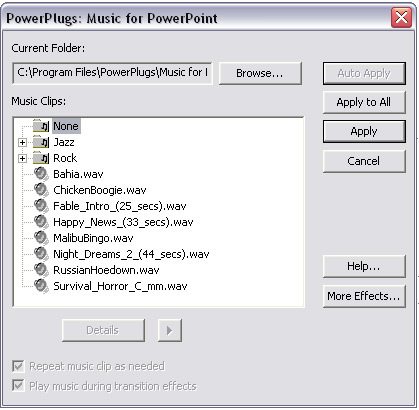 Click this button to search for music files on a CD or in locations other than the default PowerPlugs: Music for PowerPoint music clips folder, which is: My Computer>Local Disk (C:)>Program Files>PowerPlugs> Music for PowerPoint>Sounds. on its left side to help identify it as a music clip. The Auto Apply button is only active if a folder of music clips is selected (one level up from the WAV files). This button, when clicked on, automatically assigns different music clips from that folder to each slide of a presentation. Click this button to apply the selected music clips to the entire presentation. Click this button to close the PowerPlugs: Music for PowerPoint dialog box without inserting any music clip. This button provides useful links to online resources, along with copyright information and software version of your product. This button will take you to CrystalGraphics' website to give you more information about additional music clips for PowerPlugs: Music which may be newly released from time to time. Other award-winning special effects, such as 3D transitions, animated titles and other special effects for PowerPoint presentations as well as award-winning templates and photos are also available on the CrystalGraphics website. With a music clip selected, click this button to display the details about the selected music clip (such as length, size and audio format). With a music clip selected, click this triangle-shaped button to preview (play) the selected music. While the music plays, this button changes to a square block or a Stop button. Click the Stop button to stop playing the selected music. Repeat music clip as needed. You can check this option if you want the selected music to play in a repeating loop within the selected slide(s) for as long as you display the slide. If you uncheck this option, the selected music will play only once in the selected slide during presentations. Play music clip as needed. You can check this option if you want the selected music to continue to play during the slide transition(s) . If you uncheck this option, the selected music clip will play just while the slide is displayed, but not during the slide transition(s). 1. Select the slide(s) on which music has been applied. 4. Click the "Applyl" button. 3. Click the "Apply to All" button. Use the Control Panel>Add or Remove Programs tool or click on Start Button>All Programs>PowerPlugs>Music for PowerPoint>Uninstall and follow the directions from there. © 2018 CrystalGraphics, Inc. All rights Reserved. | PowerPlugs is a trademark of CrystalGraphics, Inc.